In the previous installment of this series, I went through the Web Client installation steps and showed you some challenges with ASP.NET 4.5 installation on IIS 8.0 on my Windows 8 environment. Today, I will talk about some common errors I have experienced with Web Client and show how to troubleshoot these. 1. Unexpected Error - System.Web.HttpUnhandledException (0x80004005): There was no endpoint listening at https://fqdn:48650/SessionCentralService that could accept the message. Typically, this error will appear when the Session Central Service is not running on the FQDN (fully qualified domain name) server on the port being listened on. If you open the Services snap-in under Administrative Tools, you will see that the service is stopped. If you see this error, turn on the GP Session Central Service and try to log in again on the Web Client. If the error persists, check to make sure the port is active - the default listening port is 48650. 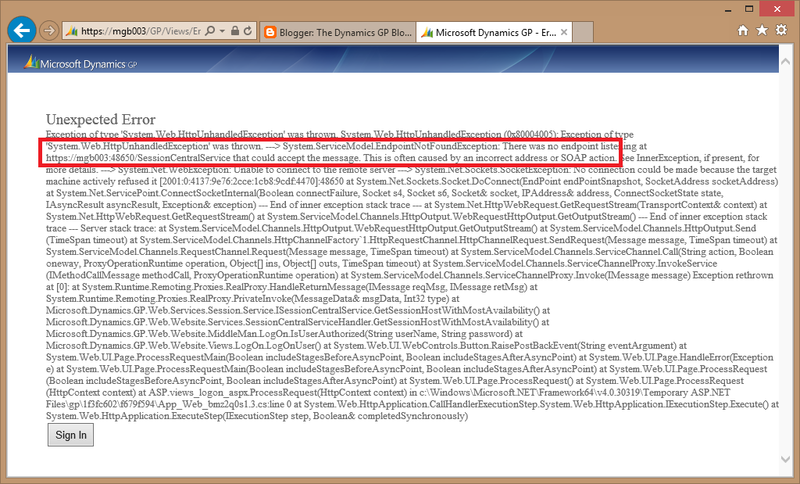 This error is usually attributed to the Session Service service(s) not running on one of the session hosts. 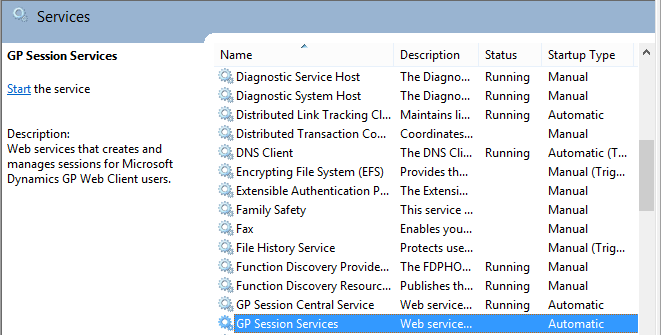 If you see this error, turn on the GP Session Service and try to log in again on the Web Client. If the error persists, check to make sure the port is active - the default listening port is 48651. 3. Unexpected Error - System.Web.HttpUnhandledException (0x80004005): Process has exited during startup with code: '-532462766'. 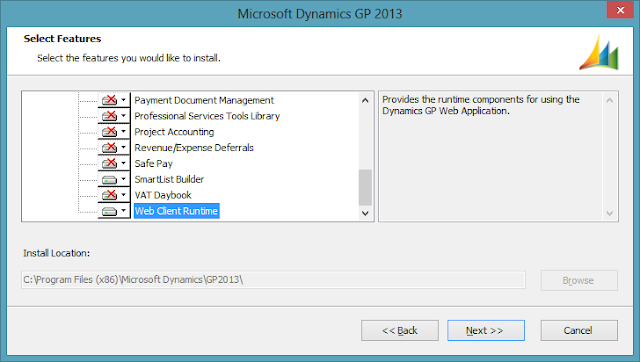 You will usually receive this error if you have not installed the Web Client Runtime during the installation of the Microsoft Dynamics GP 2013 client on your session host server. 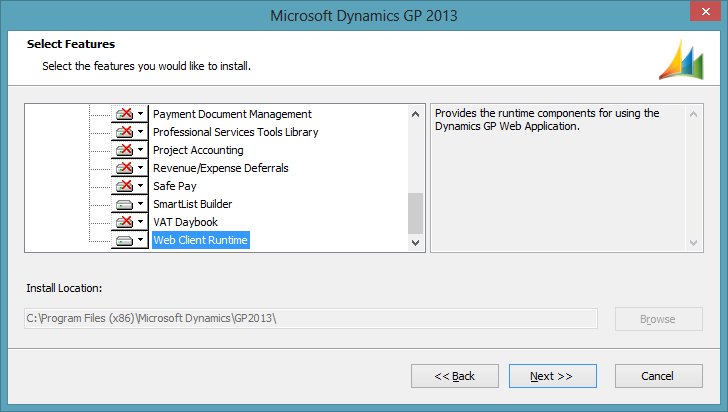 Run the Microsoft Dynamics GP 2013 setup or go to Control Panel | Programs to change the installation settings to add the Runtime feature. Of course, there are a number of things that can go wrong and these are just a few that come to mind. Damaged certificates can also be an issue and I will be covering this in my next installment, also showing some troubleshooting techniques I learned from my buddy Aaron Donat. Is there a MS site where they are taking feedback from partners about their experiences with 2013 Beta? Partner Online Technical Forum. Please let me know if you have further questions. I have come across an issue and I wonder if you have seen this behavior. After the Windows login, the page continues to show the Loading Session Information screen until it times out. There are no logs under the services and the services are running fine and no events are being triggered in the event log. Yes, I believe I have. It would help to understand however what's coming up on your screen after it times out. Also, did you make the registry changes for Silverlight?